Sometimes, in order to CREATE GREAT LOVE, it takes a village. What I mean by that is we often have different perspectives. Sometimes couples see things differently which is why we are all individuals but when challenges arise sometimes you need to talk to a friend outside of the relationship to help you see a different view. I have good friends who are great at doing different things with me. Some are great to go to the movies with, some are perfect to shop with, others are great at seeing the truth when I am unable to do so for myself. In order to be a balanced person and lead a balanced life we need our full range of friends at different times. All are equally important, and all are there for you if you need them. I have come to understand it’s important to call on the right friend for the right assistance. Especially when it comes to help with a challenge in your relationship. We want a friend who will not judge us. We want a friend who will listen and offer really good advice. We want a friend who will be encouraging and positive and after we have finished talking to them we feel so much better. We feel relief and we feel uplifted. This week’s blog is dedicated to my amazing, sweet, wonderful friends who mean the world to me. I could not imagine my life without them. You know who you are! And I love you very much! 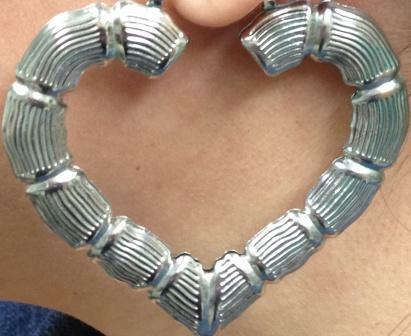 My picture this week comes from a lovely co-worker who wore these fabulous earings and in doing so reminded us all in a big way that LOVE can show up anywhere and anytime. This entry was tagged Advice, Challenge in Relationships, Couples, Create Great Love, Friends, Good Friends, Great Love, It takes a village, Love, Maya Angelou, Relationship Advice, Relationships, Touched by and Angel. Bookmark the permalink. So beautiful!!!!! You are a good friend to your friends as well!!! !